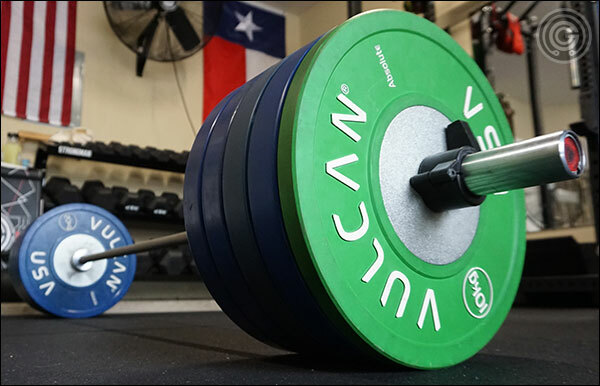 In this article; this bar review of sorts; I will be talking about American Barbell’s three major power bars – the Mammoth, the Elite, and the Grizzly. I’ll go over all of the specifications for each bar, discuss the pros and cons of each, and talk about comparable competitor’s bars. 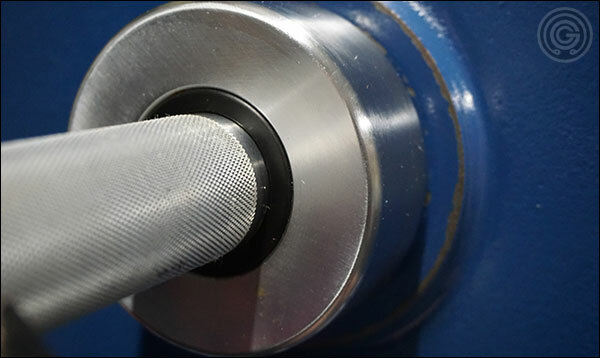 I’m also going to go into a bit of detail regarding American Barbell’s knurling because I think there is some confusion about that with some folks. 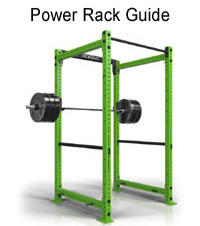 Finally, I’ll try to help you decide which of these three bars; should you decide to go with an American Barbell power bar, of course; is the best option for you based on your needs and budget. It is likely that I will independently review the Mammoth and the Grizzly, though I believe the bulk of the information that I would put in that review will be available in this article. The AB Elite has already been reviewed here if you are interested in taking a look at that. The Mammoth Power Bar replaced the popular AB Super Power Bar. The Super; for those of you who missed it; was one of the first relatively affordable, high strength, stainless steel power bars available that didn’t sell for a grand or more; like the Ivanko or Iron Wolfe power bars of the time. The Super is (was) an incredible power bar. It was odd in that it was a 28.5mm bar, and yes it was still an expensive bar at $595, but the heat-treated stainless steel shaft and moderate but incredibly consistent knurl made for one of the best feeling shafts around. Matter of fact, the Super is still my go-to bar after all these years, and I have no shortage of quality bars to choose from. However incredible though, American Barbell retired the Super and replaced it with the Mammoth Bar (and no, I don’t know why). The Super Power Bar (bottom), for some reason, had its outer knurling extend closer to the center than is typical. This was changed back for the Mammoth Power Bar. The Mammoth is very similar. It has the same high-strength, stainless steel shaft, industrial chrome sleeves, and it’s built to the same high American standards. It’s 0.5 mm thicker than the Super was and the knurl is positioned a little differently, but even with the addition of the Cerakote finish the Mammoth actually sells for about $50 less than what the Super sold for. This is pretty solid considering how well the Super sold when it was available. Competition for the Mammoth is actually a tough subject to tackle because the Mammoth is the only high tensile strength, stainless steel power bar to then have Cerakote applied. I’ve argued that the new Matt Chan is technically a power bar and it too has a Cerakote-finished stainless steel shaft, but the Chan sports a lower-strength, 28.5 mm shaft, dual hash marks, and is really marketed as a WOD bar. It’s just not an apples to apples comparison; as much as we’d like it to be. Still they do have some similarities. Vulcan’s SS Absolute Power Bar sells for the same $550 that the Mammoth sells for but the Absolute does not have Cerakote. 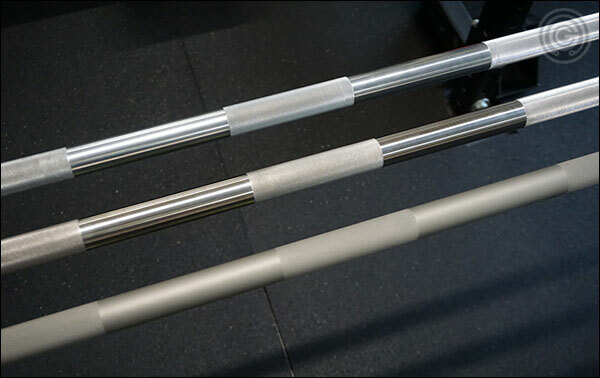 The Absolute also has really aggressive knurling, and as you’ll learn in this article and in my other American Barbell reviews, the appeal of American Barbell’s power bars is the moderate yet very refined and grippy knurling coupled with AB’s incredible build quality. 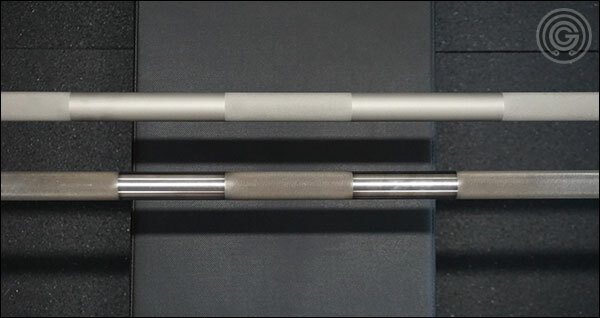 Speaking of moderate knurl versus aggressive knurl, the Rogue Ohio Power Bar is offered in Cerakote and is probably the closest thing to competition for the Mammoth; at least on the surface; but it’s not a stainless steel bar and the knurling is literally on the opposite end of the spectrum. 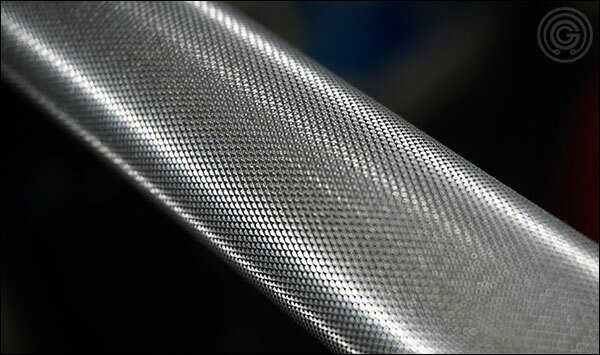 Not just the outer knurling but the center too – both very aggressive. This obviously isn’t a problem for those who like that kind of thing (and who don’t mind Cerakote sleeves), but that’s not everyone. Still, these two are similar enough. At the end of the day I think the Mammoth is in a class of its own. 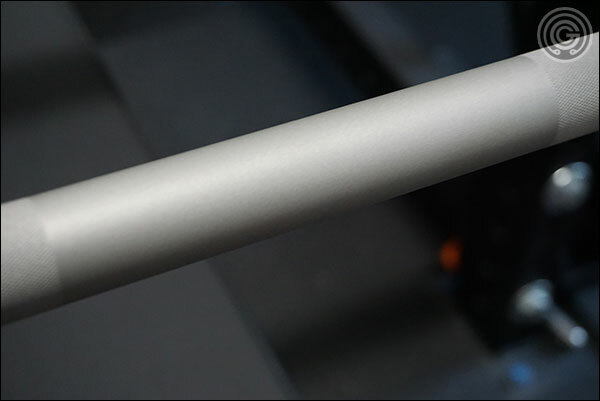 Sure it’s peculiar to apply a finish to a stainless steel shaft even if that finish is Cerakote, but as it stands this beast is currently the only high strength, American-made, Cerakote-finished power bar that does not have cheese grater knurl & center knurl. If this combination of features appeals to you then the Mammoth is your only real option. Are there any drawbacks to the Mammoth? Other than the fact that it’s expensive, no. The Mammoth is rigid as they come, the knurl is excellent, and it will never oxidize. It probably would have been just as amazing without the Cerakote (and maybe less expensive as well) but it is what it is. 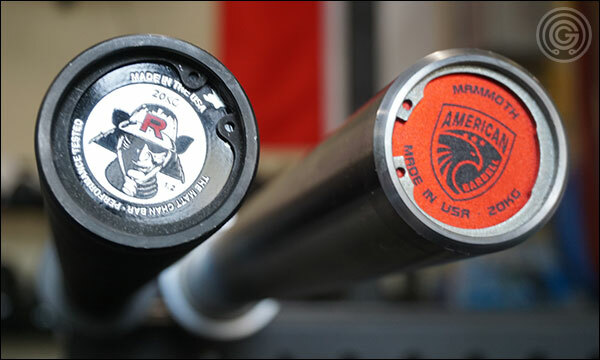 The American Barbell Elite Power Bar is a premium, stainless steel power bar. 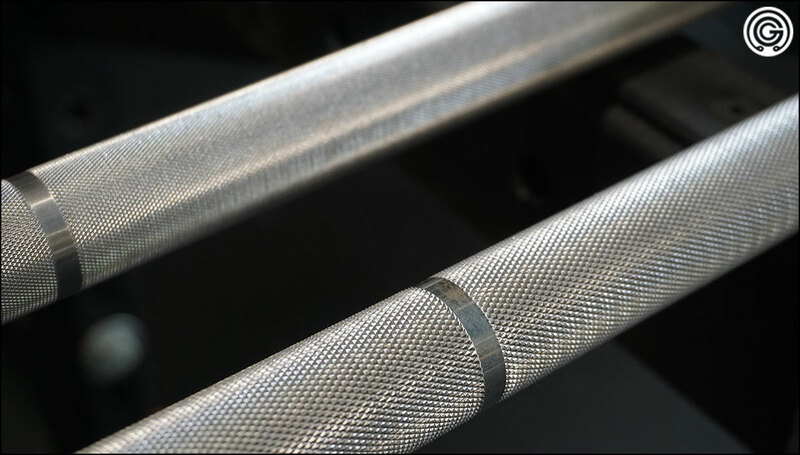 Much like a Mammoth it features a comparatively moderate outer knurling for a powerlifting bar, has an equally tame center knurling, and sports American Barbell’s standard chrome-finished steel sleeves; sleeves that are not only beautiful, but unrivaled in the resilience department. 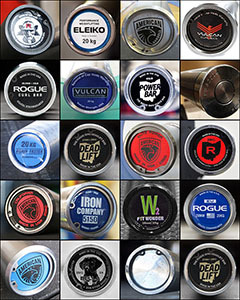 The Elite’s primary competition in the stainless steel power bar market would be the Rogue SS Ohio Power Bar and the Vulcan Absolute SS Power Bar; both of which have have much higher tensile strength shafts and more aggressive knurling than the Elite (quite aggressive in the case of the Ohio). The 20 kg SS Ohio is a little less costly than the Elite (at $425), but the Elite is a lot less costly than the SS Absolute ($549). Like all AB power bars, the Elite tends to appeal to those who don’t want super aggressive outer knurl or cheese grater center knurl. 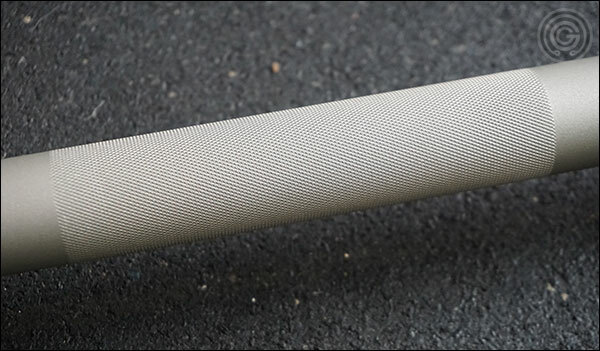 It’s not the most budget-friendly bar at $450 but it is a high-quality bar, and the precision knurling combined with a stainless steel shaft makes for an incredibly secure grip. Matter of fact, of the three power bars discussed in this review the Elite has the best grip. Interestingly enough, in terms of feel, the Elite is the closest thing to the retired Super. 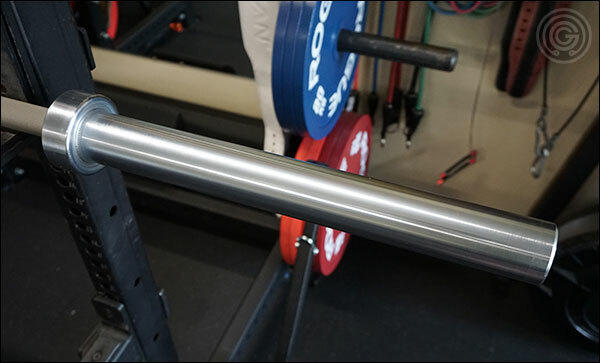 The Grizzly Power Bar is American Barbell’s economical power bar, and at just $250 for an American made, completely hard chrome-finished power bar, economical it truly is. The Grizzly is actually a hell of a deal at this price. Sure, there are a lot of bars in this lower price range but the overwhelming majority of them are import bars; most of which are made with subpar materials and have lower quality finishes. Matter of fact, the only other power bar of this caliber and at this price point that comes to mind is the bare steel, 45-lb, Rogue Ohio Power Bar, but it’s actually a very different bar than the Grizzly. It is hard to say that one of these power bars is inherently better than the other, as they are both targeting a different audience. Both bars are high value products; the Ohio because of its super strong shaft and nicely done but super sharp knurling, and the Grizzly because of its incredible quality and premium finish. They both have their place in the lower-cost power bar market. 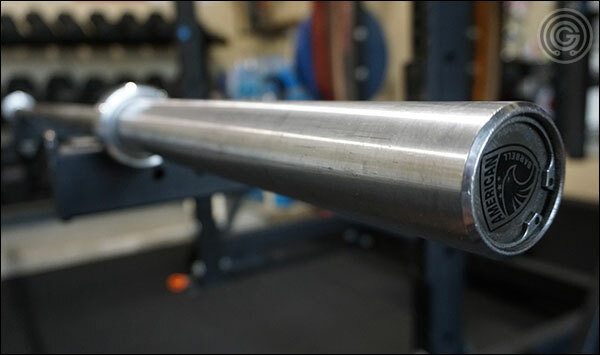 I keep talking about how American Barbell power bars are the go-to choice for athletes who want a premium bar without the typical, shark teeth knurling. I keep saying this because AB really does offer one of the most refined, consistent, and grippy knurl patterns possible, and they manage to do this without utilizing a deep, sharp knurl pattern. Now I have seen American Barbell’s knurling referred to as being “passive” but I don’t think that’s an accurate assessment. Even if only using this term to describe the knurling relative to say an Ohio or Eleiko power bar, I don’t think that passive is a good way to describe AB’s knurl, because it is not passive, it’s just not sharp. Like I said above it is refined, consistent, and grippy. It’s 100% functional; both for a secure feeling in a press and a solid, reliable grip in a long set of heavy power cleans or deadlifts. 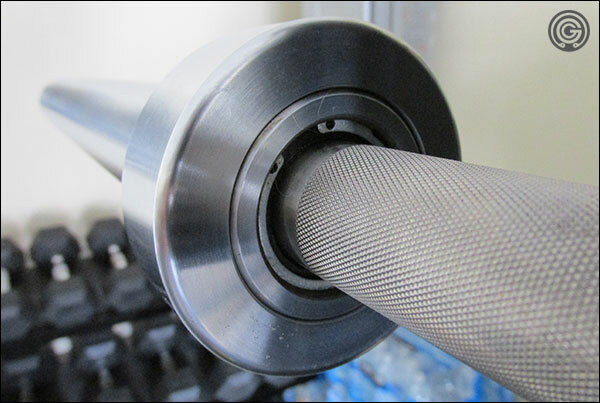 To call American Barbell knurl passive is to evaluate this feature with the eyes alone. American Barbell’s power bars can be used for heavy deadlift and power clean sets without chalk or straps. The knurl may be moderate by typical power bar standards but it’s certainly not weak. Now I’m not trying to talk anyone out of their cheese grater power bar as I’m quite the fan of these bars as well, but I am trying to make it clear that moderate knurl (relative to the sharp knurl typical of power bars) does not equate to weak or bad knurl. Well actually, if I’m being honest, most moderately knurled bars are quite weak, but we’re talking about the difference between an American manufacturer that’s been in the industry for 25 years versus; in most cases; a re-branded import from some vendor that’s been selling equipment they don’t even develop themselves for all of two or three years. In any case, AB’s knurling skills has landed them in somewhat of a unique position because finding sharply knurled power bars (even Olympic bars) isn’t exactly a challenge, but finding a bar with a comparable grip that doesn’t hurt or give huge calluses is a challenge. Outside of AB you’d probably need to go with a multi-purpose bar like the B&R to get a 29 mm, high tensile strength bar with milder knurling, though in the case of the B&R you are now dealing with the raw steel, dual marks, and cast bronze bushings. So again, if aggressive, sharp knurl is your thing, you’re not going to get that with American Barbell’s bars; any of their bars. If sharpness is your thing then by all means grab that Ohio, Absolute or Performance Power Bar; they too are fantastic power bars. Just know that your bar doesn’t necessarily have to be sharp to be grippy. Grizzly, Elite, & Mammoth Comparison – Which to buy? The Grizzly Power Bar and the Elite Power Bar have the most in common. Other than the stainless shaft on the Elite rather than the chrome-finished carbon steel shaft of the Grizzly, these two bars are basically identical. They have the same diameter, same tensile strength, same moderate knurl, and same sleeve assembly and finish. Of course, there is that $200 price difference as well, which can actually throw a wrench in the decision making process being that two bills is a lot of money to spend to upgrade a perfectly fine chrome shaft to a slightly better feeling stainless steel shaft. I’m a big fan of stainless steel shafts and of the Elite, but I have no issue telling you to pick up a Grizzly if $450 is going to hurt your pocketbook. The Grizzly is just as much bar as the Elite in terms of function, performance, and durability. Sure, there is a mild advantage to the stainless shaft of the Elite but it’s only really worth that extra $200 if $200 means nothing to you. On a budget I say go Grizzly over Elite. Also, if you don’t deadlift or power clean with your power bar there is almost no argument to be made for stainless steel over chrome. 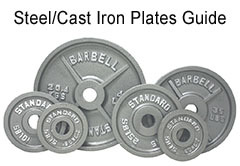 There is no real (non-pyschological) advantage to stainless steel for back squats and presses, so no reason to drop an extra $200 on the Elite over the Grizzly if you’re just a chest and arm guy. I know that sounds ridiculous to suggest someone wouldn’t deadlift but I hear about it all the time, and even fewer folks power clean! Stainless steel is for pulls; it matters not for presses and squats. Now if you’re willing (and able) to buy the Elite, should you upgrade to the Mammoth for an extra $100? As a novice probably not, unless you just want to have the nicest power bar on the block and not have to worry about potentially upgrading down the road (not that an Elite would ever actually require an upgrade.) As a more advanced lifter putting up big numbers I would say that it’s a worthwhile investment to upgrade to the Mammoth. The Mammoth is a stronger, more rigid power bar than the AB Elite; it’s a more appropriate choice for huge lifts. It has specifications that are more in line with the Ohio Power Bar and Eleiko Performance Power Bar while having the toned down knurl. It’s also arguably much better built than any other power bar you could get for the same or less money. Less important than the strength, durability, and feel of the Mammoth is the fact that it’s the only one of the three to have a Cerakote finish. Cerakote is much desired by many lifters for its feel and resilience, so if you consider that $100 gets you a stronger shaft and a premium finish then that $100 doesn’t sound so bad. If you could care less about the Cerakote finish and would be perfectly happy with the raw stainless steel and you also feel that 190k PSI is plenty for you, then Elite it is. Other than the fact that American Barbell gets a rather premium price for the stainless steel bars I don’t think that I have a single issue with any of their power bars, and truth be told I’m not sure I even have a problem with the prices even though they may be more than Rogue. The fact is that AB is unrivaled when it comes to quality of components, finishes, assembly tolerances, and knurl refinement. They probably should cost more. American Barbell bars are also incredibly quiet. Because of how tight their bar assembly is you will find no lateral play in the sleeves and hear no loose internal components. Dropping an American Barbell bar produces but a fraction of the noise that dropping almost any other bar does. The difference is actually extremely noticeable. When it comes to sleeve rotation some people think AB’s bars are slow, but like referring to the knurl as passive, this is not a very accurate assessment. AB uses industrial, composite bushings; bushings intended for heavy machinery at very high RPMs. They won’t spin like a cheap bearing unloaded and in the rack but they will handle more weight without slowing or seizing than your current bushing bar. This can actually be tested for and displayed without being an Olympian, which I think I will try to cover in a video soon. 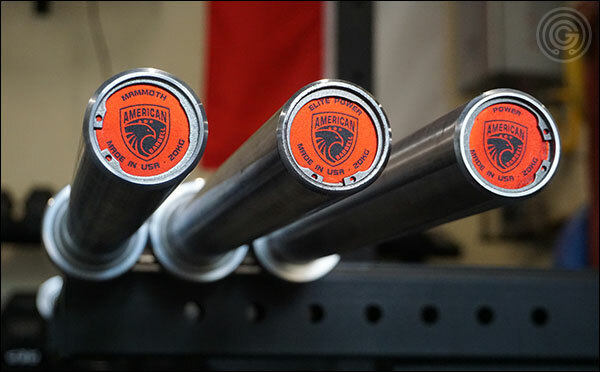 American Barbell bars are also made here in the USA, and while they are not alone in that regard there are less American-made barbells than you may think – and even of those that are you can count on one hand how many are any good. I’m a huge fan of American Barbell. I’ve yet to have any issues with any of my bars and I’ve owned no less than eight of them (I still own six of those). I have never bent one, I’ve never slowed, seized, or broken a bushing, I’ve never seen oxidation, and even on my Super that has just a crap load of miles on it I still have all the chrome on the sleeves. I’ve never had a problem recommending American Barbell bars and I don’t see that changing anytime soon. Did I miss anything? Questions? Comments? Leave them below. 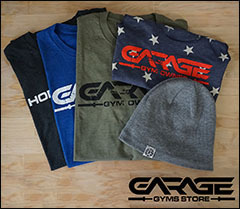 Show off them fresh gains while supporting Garage Gyms and helping to fund future reviews! I’m torn between the B&R and the AB elite mostly because of the knurling. How big a difference do you personally find there? Those two aren’t so different. Rogue’s standard knurl is generally not what I’d consider to be the grippiest when it’s finished but on a raw bar like the B&R their knurl is pretty solid. That said, so is American Barbell’s knurl, and the Elite is also a raw bar. I like the B&R a lot, but if I’m being honest I don’t ever use it anymore… for what that’s worth. Thanks. Either one will be a step up from my current bar. Gnawing my nails over that $160 price difference. I feel ya. It’s a huge difference in price. I could definitely argue for either. I went with the Rogue. It’s a pretty bar. Knurling is a bit rougher than I’m used to. But I’ll get used to it. I noticed that the knurling is slightly off center, about 1/16th of an inch. Is that within industry standards? Do you mean like the entire bar’s knurl is shifted to one side by about 1/16th of an inch? Did you catch this with your eyes or did you deliberately measure and verify for some reason? 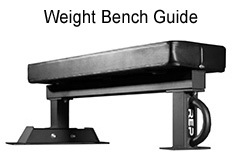 The bar just seemed off-center when I was benching. So I started measuring. All the various segments of knurling seem to be the same size left and right. And after a while I noticed that what the problem was. It doesn’t seem like it should make much difference when I lift. I’ll probably talk to Rogue sometime next week, see what they say about it. Yeah I’ve never actually heard of that happening but that doesn’t mean it doesn’t happen sometimes or even frequently. I doubt most people would notice. Odds are with all the bars that have come through my gym I’ve had a bar like that and just never noticed. Actually, as I think about how they knurl, having the starting point be off by something like 1/16th of an inch doesn’t seem so inconceivable. That’s just over a mm or so. I picked up a SPB in 2016 when they had the second close out sale. It had the normal knurl spacing but with a “sand blasted” finish. It looks exactly the same as the Mammoth. Oh yeah I remember that. Was a pretty good price if I remember correctly – in the $300’s? Why is it that you say “stainless steel is for pulls”? I believed I wanted an aggressive bar until I felt a Texas power bar today, lol. I think I’ll stick with moderate knurling or at least a bar that doesn’t feel like a cheese grater. I love the knurl of the vulcan standard and wouldn’t mind going slightly more aggressive than that. How aggressive would you say the grizzly and elite are compared to the vulcan standard? Personally I love aggressive knurling for the deadlift and I used to think I liked it for pressing, but now just the deadlift. 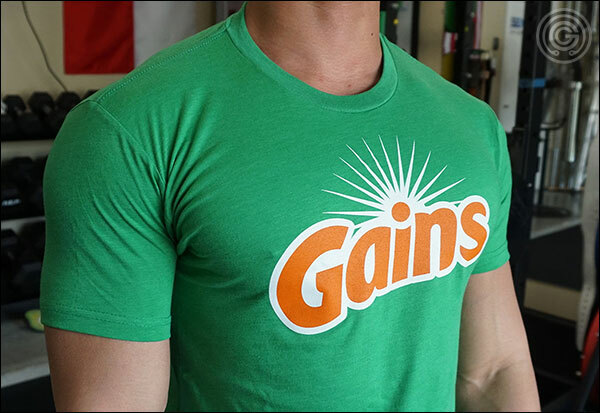 I have an Ohio Deadlift so I don’t really need that aggro knurl on anything else anymore. I don’t mind it still so long as it’s not like OPB style with the same center as outer. Pretty pointless to have a center that sharp. Was the TPB the same center as outer? I can’t remember it’s been so long since I lifted with a TPB. And in answer to your question I wouldn’t say the AB bars are more aggressive in any real sense, but the knurl is more refined on the AB bars. It should feel more secure without feeling any sharper… if that makes any sense. That makes sense. The tpb felt as aggressive through out. Lol. Maybe my calluses aren’t as thick as I thought they were. I think since I have only one bar right now, I would want to have a solid power bar to complement the vulcan standard. The tpb wouldn’t get used much. There is a lot appeal with the stainless shafts so I may go with the elite. With Black Friday coming up and so many bars on the market, reviews like this is very helpful in making informed decisions. Trying to decide between the AB Power Bar (slightly fancier Grizzly, the Grizzly is currently sold out for awhile) -$320 shipped vs. the Mammoth Power Bar ($495 shipped). I have never used a cerakote bar but I am intrigued by the Mammoth and something just seems cools about. I doubt I will ever be strong enough to really notice a difference in whip squatting, but do you feel the grip is really that much better on the Mammoth than the chrome plated bars? There is no real difference between the Grizzly and the AB Power Bar, so definitely don’t pay more for the AB Power Bar. Wait for the Grizzly. OR, if you want to go with a Mammoth that’s acceptable too. It’s an infinitely nicer, grippier bar. Cerakote-finished and bare steel shafts make all the difference in the world when it comes to grip – especially when compared to chrome, which is a rather slick finish. I’m not saying anyone needs a $550, Cerakote-finished, stainless steel power bar, but it’s a nice bar indeed, and the last one you’ll buy (out of necessity anyway). Plus it is on sale I guess and ships for free – that always helps. And oops! I just noticed the Grizzly is $275 now instead of $250. Hrmm. Well $20 on the AB Power Bar to not wait for the Grizzly doesn’t seem so bad I guess. I currently have an SS OPB, and love it. 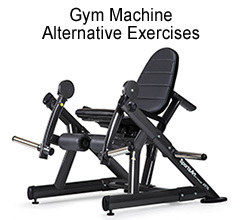 I have been looking at getting an AB power bar to have the milder knurl for use on pressing movements, and will be getting either the elite or the Mammoth. I am not concerned about the price difference between the two. Functionally, would I ever notice the difference between 190k vs 210k? I press in the low 2’s, and bench in the low 3’s. I am leaning toward the mammoth because I am a sucker for marketing and like to have the “best.” Is this silly? Should I save the money and get the Elite, or does the mammoth have a functional advantage? You’d probably never notice a difference if you’re not squatting with it, and even then you probably still wouldn’t. 29 mm bars are all pretty rigid. What tends to separate a good power bar from a bad one isn’t so much how much it flexes at that diameter, but if it’ll permanently deform. Move enough weight with a 130k PSI CAP power bar and it’ll always feel rigid, but it will probably ultimately develop a bend. You’re not going to bend a 190k bar with 300-400 pounds. Now that’s not to say that given enough weight that a 29 mm bar doesn’t “whip”, but I haven’t noticed a difference in flex between the 190k Elite and the 210k Mammoth, and I do squat with my AB bars, not just press. Matter of fact, outside of reviews I only use the AB bars (well for everything but deadlifts, but I have a DL bar. If AB offered one I have a feeling I’d own it lol). Whether you want to pay the extra hundred for the bonus strength and Cerakote is just preference. The Mammoth is a pretty nice bar, and more appropriately priced than the Elite in my opinion. That is to say, I think the Elite should be closer to $400 than $450. I suppose that makes the Mammoth a better “value”, though $100 is $100.